Light at the end of the tunnel … the state government hopes to privatise Jenolan Caves. 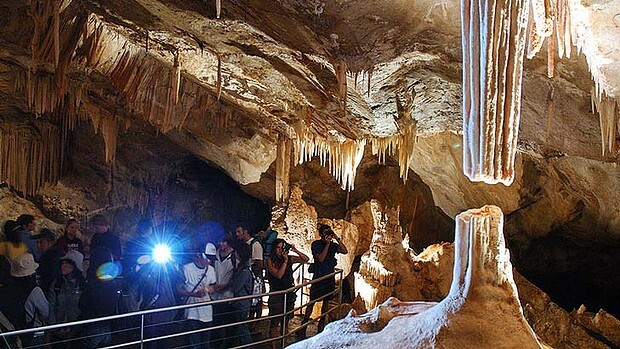 NSW taxpayers have pumped $11 million into the historic but loss-making Jenolan Caves over the past nine years. Now the caves will be opened up for privatisation by the state government. The Environment Minister, Robyn Parker, said the precinct had the potential to be one of the state’s premier tourist attractions, but it had ”failed to flourish”, and had been receiving subsidies of up to $700,000 a year. While about 226,000 people visit the caves every year, only 10,000 stay overnight at the historic Caves House hotel. ”There is no reason Jenolan can’t be more successful and stand on its own two feet,” Ms Parker said. The former Labor government announced similar plans in 2010, but they did not go ahead. Ms Parker said the previous attempt showed that a private sector operator of Caves House needed the right to manage cave tours for it to be financially viable. She said proposals would be sought early next year to take over management of the caves, including from business, local government, charities, individuals and the not-for-profit sector. They would be offered a long-term lease on the hotel and another 30 buildings on the site, as well as access to the caves. When Labor announced its plans in 2010, it was accused by the Nationals leader, Andrew Stoner, of ”being sneaky” and ”trying to flog off this Australian icon on the quiet”. A spokesman for Ms Parker said Labor had ”proved time and time again” it was incapable of working with the private sector. ”The community had no confidence in the former government – as was evident at the election,” he said. It is understood Jenolan Caves staff were briefed on the proposal on Wednesday. Ms Parker said the government would negotiate with any private operator to protect jobs at the site. ”The staff are one of the major assets,” she said.